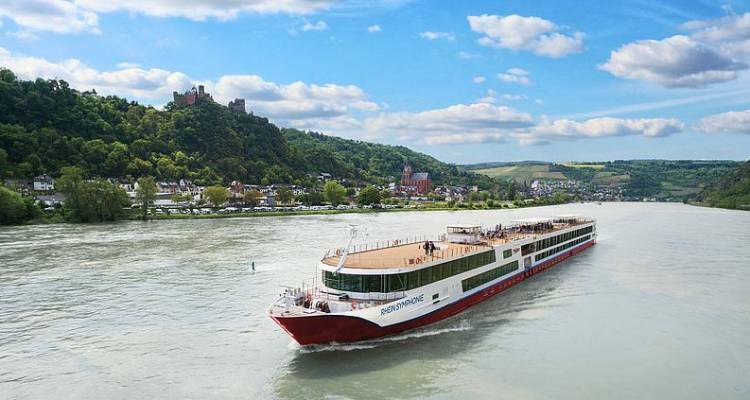 Modern and elegant trip on “Father Rhine” - expect bright rooms and plenty of space for your dream river cruise on our MS RHEIN SYMPHONIE. The large panorama windows guarantee the best views of the passing shoreland, and the spacious sun deck invites you to relax. In the spacious cabins, recharge your batteries for new discoveries along the great river. In the panorama restaurant, we serve exquisite specialities, whilst the bar in the panorama saloon invites you to take a drop of the good stuff. The main deck cabins have panorama windows that cannot be opened. The main deck aft cabins have a size of approx. 11.5 m², have large panorama windows that cannot be opened and are all equipped with a fold-down bed and a sofa bed. The cabins are furnished in style and comfort with an air conditioning system / heater that can be regulated separately, shower/toilet, SAT TV, telephone, hair dryer and safe. At meal times, all guest will find a place in the generously arranged panorama restaurant. Let yourself be pampered by the friendly staff. International specialities can be found in the menu, as well as dishes from kitchens of the countries along the travelling route.